jQuery $.post() method is used to request data from a webpage and to display the returned result (sent from requested page) on to that webpage from where the request has been sent without page refresh. $.post() method sends request along with some data using an HTTP POST request. The URL parameter is defined for the URL of requested page which may communicate with database to return results. The data parameter is defined to send some data along with the request. The callback parameter is defined for a function to be executed if the request gets succeeded. This contains two sub parameters , the first one holds the returned data from the requested page and second one holds the status of the request. //"response" receives - whatever written in echo of above PHP script. Note : Both ‘ data ‘ and ‘ callback ‘ parameters are optional parameters, whereas URL is mandatory for $.post() method. The following example uses the $.post() method to send some data along with the request. alert("*----Received Data----*nnResponse : " + response+"nnStatus : " + status);//"response" receives - whatever written in echo of above PHP script. And here we have “jquery_post.php” file , which contains following PHP codes, that reads the request, processes it and return the result. // Here, you can also perform some database query operations with above values. 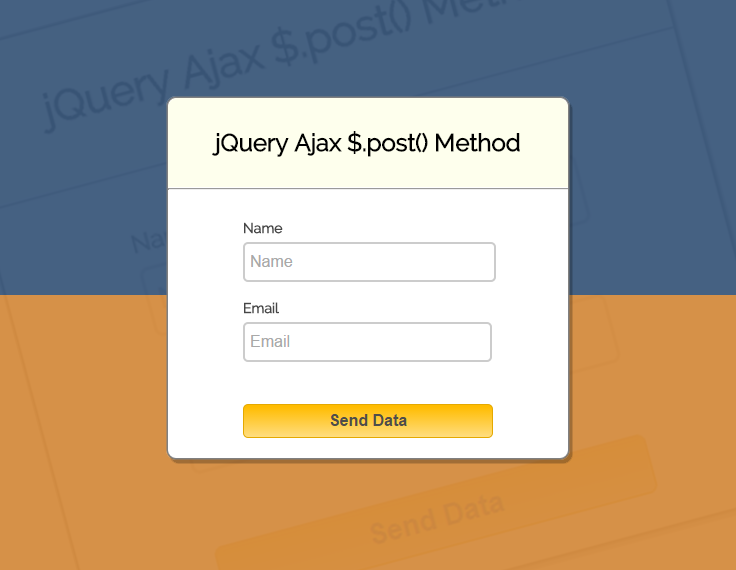 With above tutorial you became familiar with jQuery’s $.post() method. Hope you might have liked it, to learn more & to get more coding tricks keep reading our other blogs. nice and useful tuturial but sumthing is wrong. should be email:vemail because in php script you get email not city. thanks again for yout attention to my comment. Thanks for looking into it ! submit data using ajax jquery was very good example i want to know how to receive data from php into a application.. I have been to probably 30 tutorials on this, and yours is by far the cleanest and most easy to understand. Thanks for posting this! It works like a charm. Very simple and clean. For readability, I’d consider using the isset command within PHP. Also, regarding the handling of received data, I’d suggest having the PHP file return a true or false statement and have the php file do what you want it to do when the button is pressed. This way, you’re increasing functionality and using the data flow more wisely. Is this possible in java version phones?